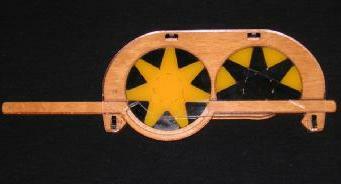 These Slide Rule Duel puzzles have pieces which in the top half of the frame form two large circle segments, and in the bottom half only one small circle segment. The bottom half can slide left and right so that its segment can line up with either of the top parts to make a complete disc, which can then be rotated. The Pentaplenty has, as the name suggests, discs with 5-fold symmetry. Each disc has a pentagonal centre, five pointy pieces around that which form a pentagram, and five outer pieces between those points that fill up the rest of the disc. 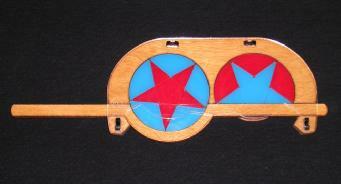 In the solved position, the left disc is complete and shows a red pentagram in a blue disc, and the right (partial) circle has reverse colours, i.e. a blue pentagram in a red disc. The Heptalive on the other hand has 7-fold symmetry. Each circle has a heptagonal centre, seven tiny triangular pieces round it, seven pointy pieces around that which form a heptagram, and seven outer pieces between those points that fill up the rest of the circle. The sliding circle segment contains one tiny triangle, two pointy pieces, and three outer pieces. In the solved position, the left circle is complete and shows a yellow heptagram in a black circle, and the right (partial) circle has reverse colours, i.e. a black heptagram in a yellow circle. The table below shows how many pieces of each colour there are of each type. I have used a computer to calculate God's algorithm for the Pentaplenty, and the results in the table below show that any position can be solved in at most 10 moves (6.9182 on average), or 14 (9.3849 on average) if every 1/5 of a turn is counted as a separate move. The single position that is antipodal in both metrics is shown on the right. Apart from the sliding bottom half, each circle is a single colour. Using the move notation below, it is reached by the move sequence R' L' R R L R R L' R R L R' L L.
The results for the Heptalive in the table below show that any position can be solved in at most 16 moves (12.119 on average), or 26 (20.147 on average) if every 1/7 of a turn is counted as a separate move. PuzzleAtomic is Douglas Engel's site. A clockwise turn of the left or right disc of one step will be denoted by the letters L or R respectively. Turning a disc anti-clockwise one step will be denoted by L' or R'. Hold the puzzle with the slider at the bottom. Phase 1: Solve the points and outer pieces of the right disc. Make sure at least one point piece matching the right centre colour lies in the right disc. Rotate the right disc to bring this solved point piece to the bottom right, adjacent to the slider. Find a point piece in the left disc that has the same colour as the right centre. If there are none in the left disc, then do R' L R and look again. Rotate the left disc until that point piece lies in the bottom section, or bottom-right in the Heptalive. Then do R' to put it in place in the right disc. If the outer piece adjacent to the point piece you just solved is already of the correct colour (different to the point piece) then skip to step g.
Find an outer piece in the left disc that has the same colour as the left centre. Turn the left disc so that that outer piece lies at the right of the bottom section. Repeat steps b-f until all the points and outer pieces are solved. It is fairly easy to solve phase 1 in far fewer moves by solving the pieces in pairs rather than individually by the steps above. Whenever there are two adjacent pieces (point and outer piece) in the left disc that belong on the right, you can solve them at the same time by adding them to either end of block of solved pieces on the right disc. If there is no such adjacent pair, it takes a little ingenuity to bring them together in the left disc, and then you can solve them as a pair as before. Rotate the left disc to bring any incorrect tiny piece to the bottom and do L' so it points bottom right. Rotate the right disc to bring one of its incorrect pieces to the bottom. Rotate the right disc back to its normal position, undoing the move from step b.
Repeat step a-d until all the tiny pieces are solved.